Tirupati: The high-stakes battle for power in the state and the Centre unfolded across Andhra Pradesh, which simultaneously elected its Lok Sabha and Assembly representatives on Thursday, with widespread violence between party workers of regional giants — the Telugu Desam Party and YS Rajashekar Congress Party. Allegations of distribution of money and EVM malfunctions, the scale of which is under debate, drew considerations from the Election Commission regarding repolling in certain constituencies. A total of 2,395 candidates battled it out for 175 Assembly seats. 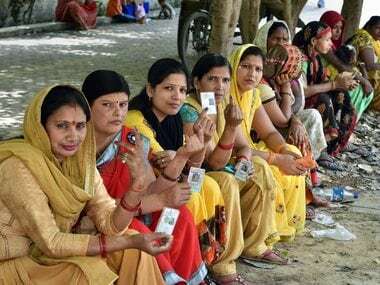 Voting percentage had touched 75 percent across the state by 6 pm, and was expected to rise to 80 percent as polling was still underway and long queues were reported in some booths. In some constituencies like Puthalapattu, the inter-party clashes turned so violent that polling had to be stopped at 3 pm. 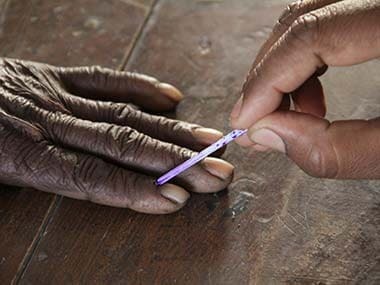 The decision about repolling here and at any other places will be taken on Friday, in consultation with the Election Commission of India, the state's Chief Electoral Officer, Gopalakrishna Dwivedi said in the post-poll press conference. Even without the fact that it had allowed itself to be drawn into the state's political drama, the EC had a rather terrible polling day of putting out defences against allegations of large-scale EVM failures. The night before Phase 1, Chief Minister Chandrababu Naidu met with Dwivedi at the secretariat in Velagapudi, Amaravati. During the meeting, Naidu protested against the alleged bias by the EC in favour of the Opposition YSRCP, especially in the transfer of key officials. Naidu also accused the EC of playing into the hands of Prime Minister Narendra Modi. On polling day, YSRCP chief YS Jaganmohan Reddy pointed to this meeting to allege that the chief minister was threatening the EC. Naidu has demanded repolling at places where EVMs did not work. He told the local media that 30 percent of the devices malfunctioned and as a result, polling started up to three hours late at many places. "Even technologically advanced countries are not using EVMs... a voter doesn't get the satisfaction of voting through ballots when they are voting on the EVMs. They don't ensure transparency. EVMs are not correct for the voting process. Today, there are reports of EVM malfunctioning from many booths," he said. "Some news channels are reporting that 30 percent of the EVMs are not working, which is not correct. In total, we have 45,959 booths, and we are using around 92,000 EVMs, of which we have got 344 issues and 25 are still pending," said Dwivedi. But embarrassingly, he could not cast his vote due to technical issues with the EVM at the Undavalli polling station in Tadepalli, which falls under Mangalagiri Assembly constituency, despite making it there at 7 am. He went later on in the evening to cast his vote after the EVMs there were restored. Sporadic incidents of violence between party workers continue to be reported across the state with casualties on both sides. YSRCP workers allegedly attacked Speaker of the Andhra Pradesh Legislative Assembly, Kodela Sivaprasada Rao, who went to inspect a polling booth in Guntur's Sattenapalle constituency. Another TDP minister's husband and sister were injured in a violent clash between factions in Atahobilam in Kurnool. Allegations against opposing party workers came thick and fast from Narasraopet, Eluru in West Godavari, Jammalamadugu in Kadapa District and Mydukur. A viral video of the alleged attack by Eluru TDP MLA Badeti Bujji on YSRCP party workers in West Godavari district's Sanivarapupeta grabbed the nation's attention — diverted as it was with the first phase of polling held across 20 states and Union Territories — to the brawling between the two biggest state parties. A bloodied party worker was seen asking, "Is it right for an MLA to do this? Is he an MLA or a rowdy? Why does he have a gunman? To beat people up? We have come here to vote. Four people came in a car to hit us." In another dramatic incident, Jana Sena Party Assembly candidate Madhusudan Gupta damaged EVMs at Gooty in Anantapur district, ostensibly protesting the alleged partisan manner in which polling officials were conducting duties. The police arrested him. The electoral outcome in Andhra Pradesh is set to become a watershed in moulding the course of national politics and is a 'Do or Die' battle for both Naidu and Opposition leader Jaganmohan Reddy. For Naidu, who is gearing up to hand the reins of Andhra Pradesh reign to his son, Nara Lokesh, in order to be able to play a bigger role in the national level if the opportunity arises, a strong showing in his own backyard is imperative. Jagan, who narrowly missed the bus in the 2014 state elections (TDP had a narrow lead of less than one percent over its rival in votes polled), cannot afford to sit in the Opposition for another five years. The son of former Andhra Pradesh chief minister and popular Congress leader YSR Reddy, may find it difficult to keep his flock together without power. But over the past five years, YSRCP has been steadily gaining strength, probably best evidenced by the mass exodus from the TDP ahead of the election, when 23 of MLAs and three MPs switched to the YSRCP. Also by expertly egging on the TDP to take on alliance partner BJP over the granting of special status to the state, Jagan forced the TDP out of the Central government. YSRCP now promises to deliver what TDP couldn't despite its cosy relationship with the Centre and ministerial berths in the Union government. Jagan is intent on scuttling Naidu's national aspirations by aligning with Telangana chief K Chandrashekar Rao, who is batting for a federal front. The TRS and YSRCP, having openly exhibited their camaraderie initially, toned it down and desisted from open overtures. TRS supremo, KCR, however, by promising to support special category status for Andhra Pradesh the day before the campaign ended, tried to blunt the flak being faced by the YSRCP from anti-Telangana forces. 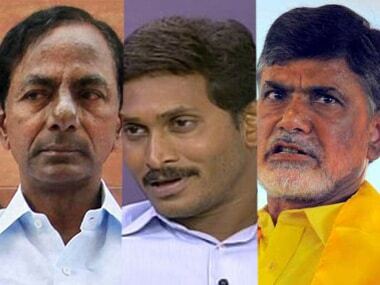 Taking a cue from Telangana's Assembly elections last year, when the TDP was routed from the state after a vociferous TRS campaign that branded it an "Andhra party", Naidu has been dubbing his rival Jagan, KCR and Modi as anti-Andhra forces to stoke regional sentiment. However, the TDP chief weathers strong anti-incumbency, and no longer has the support of former NDA partner BJP or the Pawan Kalyan-led Jana Sena Party, both of whom are contesting independently. The BJP, which won four Assembly seats and two Lok Sabha seats in 2014, has taken a hit in popular support with the TDP and YSRCP making special category status their main campaign plank. The TDP, which rolled out a slew of schemes essentially transferring money from the public exchequer to the people, is banking on them to beat any anti-incumbency working against it. "But the anti-Telangana sentiment being stirred by the TDP may not be a game changer in 2019. The exaggerated fears expressed during Telangana agitation have been blunted. The voters across Andhra Pradesh have more affinity to Hyderabad than Amaravati with no stakes attached to the place for now. In this milieu, reports of a huge shift in voters by those settled in Telangana to TRS were not surprising. The umbilical cord that binds the Telugu people across the regions cannot be wished away," said veteran journalist A Raghava Sharma. Testament to this is the lakhs of voters from across Telangana who travelled south over the past two days, braving traffic snarls along the highway and overcrowded trains and buses. The TDP has steered clear of aligning with Congress in the state, although it still vouches for alliance with the Congress-led UPA at the Centre. It has learnt its lesson from its alliance with the Congress in the Telangana Assembly election. Further, the TDP was started by its patriarch, the late NT Rama Rao, with an anti-Congress sentiment. Either way, the Congress is barely holding on in the two Telugu states and Andhra voters are essentially punishing the party for bifurcating the state.